Founded by the Arabs under the shelter of a tenth century fortress, Benahavís is today a perfect combination of the traditional and the modern. A charming village with endless possibilities as a top tourist destination, where the British population makes up some 25% of the total population of the town. Thanks to its strategic location, Montemayor Castle became an important stronghold during the wars among the Taifa kingdoms of the former Al-Ándalus. The fortress was built in the tenth century and still retains some of the original walls, the Queen's Tower, chambers and a water well. The spot also offers splendid panoramic views of the coast. Benahavís also boasts several Arab watch towers which form a comprehensive defence system. La Leonera Tower, which controlled the access to the valley of the river Guadalmina, next to Alcuzcuz, Tramores and Daidín Towers are some of the towers still standing in the town. Although it was built in the 16th century, Benahavís Palace clearly takes its inspiration from the Nasrid dynasty. The building has dark stone walls, a beautiful arcaded courtyard and a tower. Today it is home to the offices of the Town Hall. The most significant piece of religious architecture in the town is Virgen del Rosario Church. Founded in the 18th century, it has undergone many renovations over the centuries. The present temple is a simple modern building with a single nave. There are some 80 kilometres between Malaga and Benahavís and the journey takes approximately one hour if you take the toll roads. Drive along the AP-7 towards the Mediterranean Highway and leave the AP-7 at junction 181. Continue along this highway and take the A-7175 to reach Benahavís. Benahavís lies in the foothills of the Serranía de Ronda and between the districts of Marbella and Estepona. 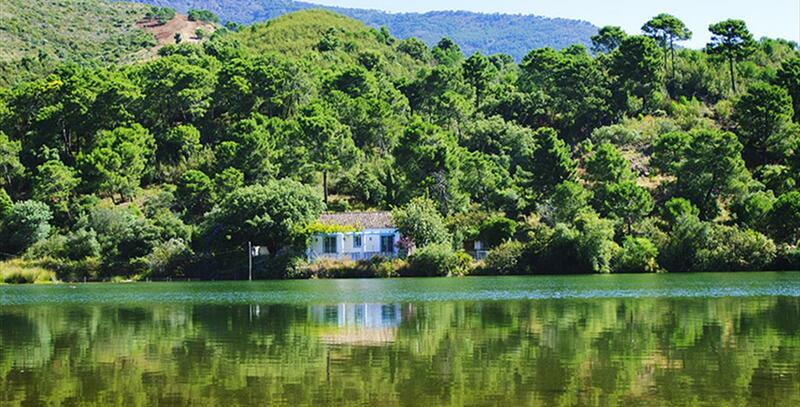 Large expanses of pine trees, Holm oaks and cork oaks cover a large part of the district which is crossed by the rivers Guadalmina, Guadaiza and Guadalmansa. Some of the most attractive areas include the cerro del Duque, the paraje de las Máquinas, the coto de la Zagaleta and the valley of the Guadalmansa. The prominent landscape and the variety of fauna and flora are the main attractions of these spots, perfect for enjoying the natural environment. Other options include a visit to Puerto Capuchino Cave and la Leche reservoir, or head towards the Charca de las Mozas and the Narrow Gorges of the river Guadalmina to go canyoning. From the hills of Benahavís, you can make out over 100 kilometres of the coastline and on clear days you may even see as far as Africa. Benahavís is considered to be the golfing centre of the Costa del Sol, with ten 9, 18 and 27 whole courses, surrounded by stunning countryside. Two of these belong to an exclusive club, which also has its own private hunting reserve. This district of the Costa del Sol also has a renowned equestrian centre, with two arenas and excellent facilities for every type of equestrian competition. Benahavís Fair is the main event on the festive calendar of this town on the Western Costa del Sol. It is held in the middle of August and includes a variety of activities including a parade, evening festivities and the procession of the Virgen del Rosario. Two months later in October, the patron saint of the town is again in the limelight. This time in the Romería. In Holy Week, two stewards and two stewardesses elected by the town demand and collect products from the municipal vegetable gardens. The curious booty is used to serve a multitudinous supper to which all the local residents are invited. The same day, the figure of Jesus is placed in a small hut known as the Huerto del Niño, and next to this a tree from which a small figure of Judas is hung. The meeting of the Virgen del Rosario with her Son and the procession of both figures takes place on Easter Sunday, and is the most moving moment of Holy Week in Benahavís. 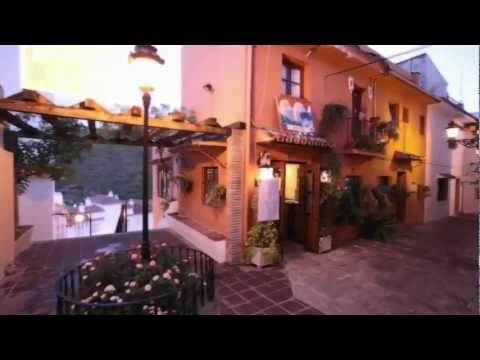 Placed between the sea and the mountains, the cuisine of Benahavís combines the best of both. The dishes served here include rabbit and partridge stews, suckling pig, lamb, chorizos al agua and zarzuela de pescado y marisco (a seafood casserole tasting of the Mediterranean). The district is also renowned for the excellent quality of its restaurants and the variety on offer to diners. Such is the importance of the cuisine in Benahavís, it has had its own School of Catering, called Sabor a Málaga /Flavours of Malaga) since the end of 2013. The earliest settlement in the area where Benahavís stands today dates back to the late eleventh century. It was founded by the Muslims, in the shelter of the Montemayor Castle, which had been built a century before. The town"s name derived from the Arabic word "ben" ("son") and the proper name Havis, a leading official living in the castle. His son is said to have built the defensive towers, aimed at protecting the area of the river Guadalmina. According to other historians, the name "Benahavís" comes from the phrase "Ben Habix", "sons of the Abyssinian", in reference to a civil judge from Abyssinia who settled in the area. The castle played a key role during the wars between taifas in Al-Andalus, which came to an end with the Christian Reconquista of Andalusia. In 1485, the army of the Catholic Monarchs seized Marbella and its surroundings, transferring the land to the Count of Cifuentes for his services to the Kingdom of Castile. Almost a hundred years later, in 1572, Benahavís gained independence from Marbella.